On December 4 and 5, the First Italian Open Shogi Championship was held in Milano as part of the Giochi Sforzeschi, a 5-day long Mind Sports Festival. The ambiance was excellent: we played in one of the museums the Castello Sforzesco sports, a beautiful hall full of magnificent ancient tapestries and musical instruments. The Shogi event attracted 11 participants: 5 Italians, 2 foreigners living in Italy, and 4 other foreigners. After securing the Dutch title recently, Frans Roquas went on to grab the Italian Open title as well. Only one Bucholz point separated him from Terje Christoffersen, though, who played very impressively. Giuseppe Baggio had good winning chances against both Terje Christoffersen and Antje Rapmund, but gave them away in byoyomi. He did, nonetheless, secure the Italian "Closed" title. Giuseppe has a lot of potential and I would not be surprised if he were able to compete with the European elite in the near future. All in all, it was a very enjoyable tournament and next year we aim for 20 participants! 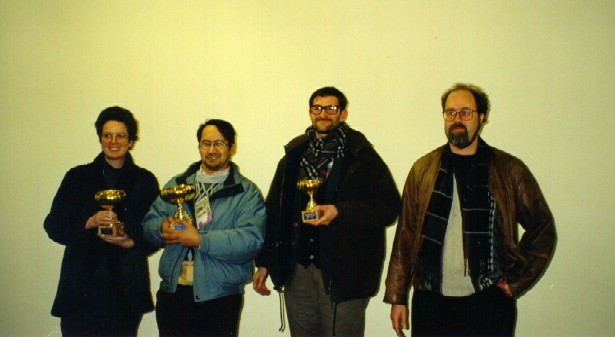 Prize giving ceremony: from left to right, Antje Rapmund (who receives the second prize on behalf of her husband Terje Christoffersen), Frans Roquas (winner), Giuseppe Baggio (Italian Champion), and Pieter Stouten (organizer). Click here to download the games played during the tournament by the Italian Champion Giuseppe Baggio (zipped Word file).